Trastevere is a hub for great food, from pizza joints, bakeries and a fair few family-run trattorias. 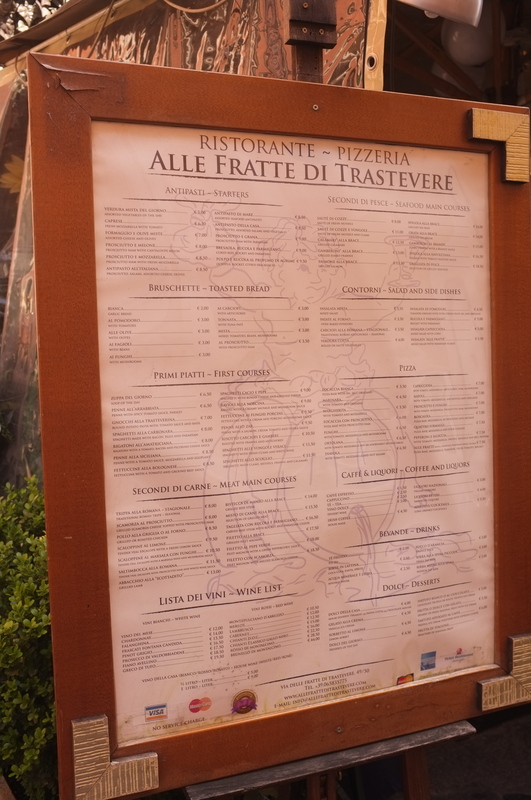 Alle Fratte di Trastevere is, in my opinion, one of the best in this vibrant bubble in Rome. Here, you can find true Roman cuisine, as well as a few southern staples, for a very fair price, washed down with a decent bottle of house wine. The first time that I visited Alle Fratte, I was meeting a friend. I arrived a little early and waited for her outside. While I was waiting, out popped owner Francesco, a extremely friendly old man (not to be patronising) who approached me with a smile and proudly showed me the Lonely Planet review of his restaurant, inviting me in to eat in his endearing broken english. I had, in fact, read that very review and ensured him that I intended to eat there just as soon as my friend arrived and he graciously slipped away to check on his current diners. This is a reflection of all the staff here who are extremely attentive and dedicated to great food and customer service. I felt immediately at home eating here. In the summer, a few tables are available outside, shaded by an ivy canopy. In winter, you’ll feel warm and cosy inside the restaurant, which opens up like a Mary Poppins’ bag into a rather large space on two floors. 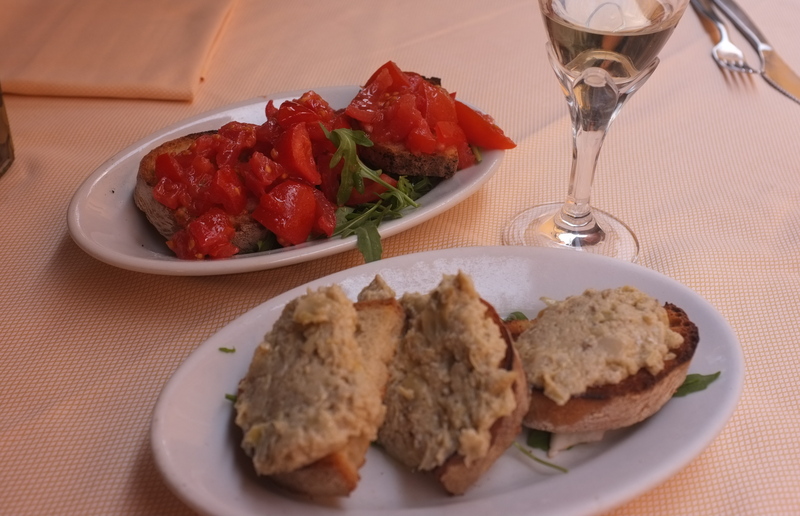 Bruschette are a house speciality at Alle Fratte di Trastevere. The classic bruschetta al pomodoro uses the most delicious, velvety, fresh, bursting with flavour tomatoes I have ever eaten, dressed in a beautiful high quality olive oil with a sprinkling of rocket. 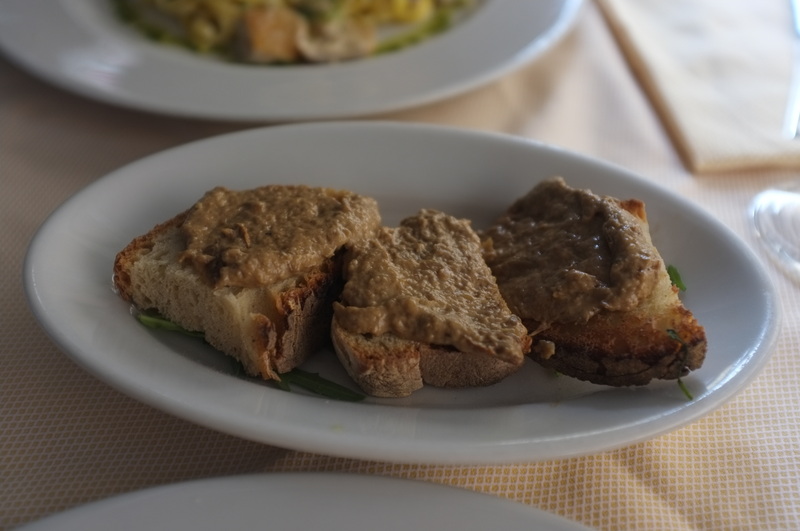 Alongside this classic version, you’ll find bruschetta ai carciofi with soft and slightly tangy artichokes, bruschetta alle olive, bruschetta tonnata with succulent tuna and bruschetta ai funghi topped with a smooth, rich and pungent mushroom purée (all €3). First courses include soup of the day, risotto and classic pastas, such as rigatoni all’amatriciana (€8.00) with bacon and Pecorino cheese, cacio e pepe (€9.00); a cheesy Roman classic and spaghetti allo scoglio (€11.50), brimming with fresh seafood and . There are also some more modern dishes, like the penne allo zar (€9.50) with a salmon, cream and vodka sauce. 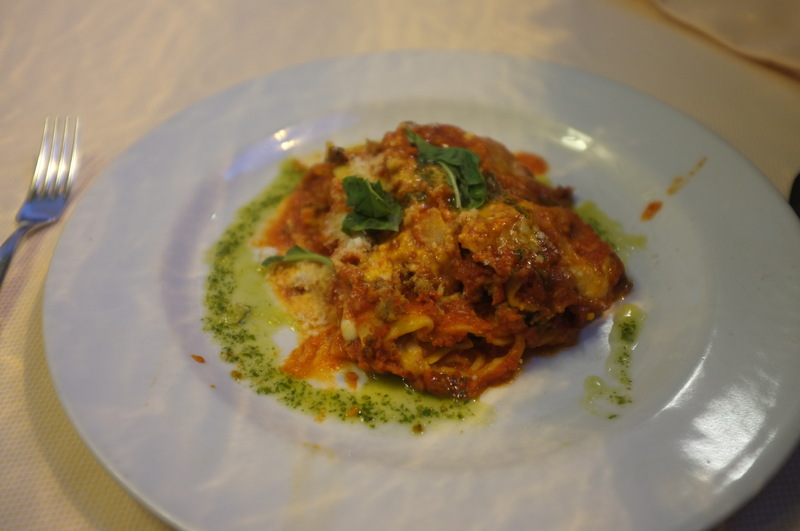 Before coming to Alle Fratte, I had been fairly unimpressed with Rome’s lasagnas. Here I found one that I really enjoyed (although it still doesn’t compare to my mum’s!) There was a nice balance of pasta to filling and the surrounding basil oil was very tasty. My only complaint is that I would have liked a little more béchamel sauce. The lasagna does not appear on the restaurant’s main menu, however, it is very open their special, so be sure to ask. The risotto carciofi e gamberi (€10.50), a creamy but light seafood ricotto with shrimp and artichoke was beautiful. The fragrant basil oil from the lasagna dish appears here, giving an unexpected burst of herbiness to some bites. The shrimps came in their shells; they tasted fresh and well well cooked, retaining a little bite. 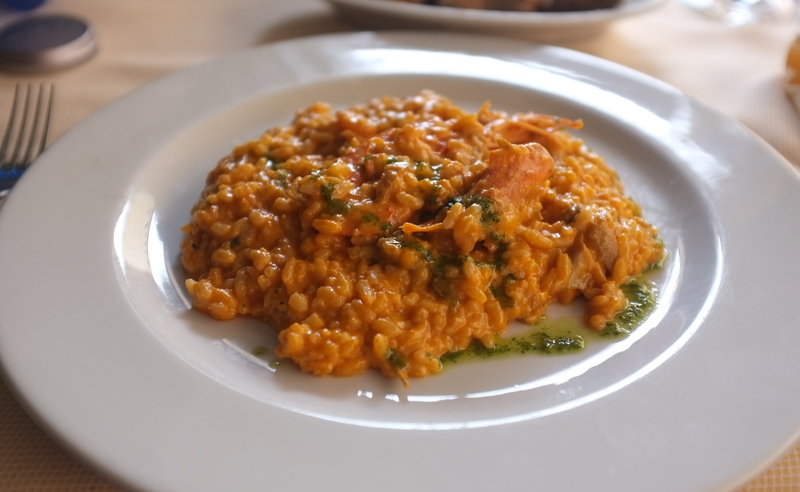 Some say that risotto is a rather boring dish as every bite is the same – Alle Fratte could certainly change your mind – I didn’t want the rice to end. Pair this dish with a crisp white wine to elevate the seafood flavours and bring out the artichoke. Both meat and fish dishes are available for secondi. 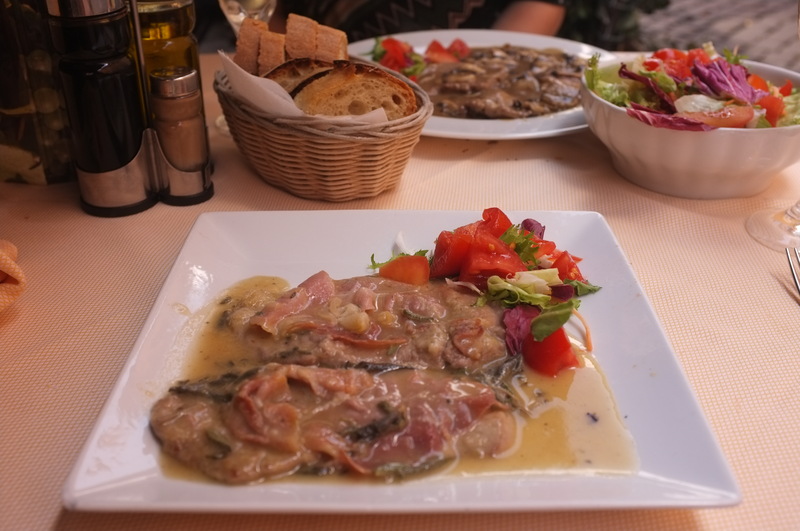 I chose a popular Roman dish; saltimbocca alla Romana (€11.50), while my friend went for the scaloppine al Marsala con funghi (€10.50). The saltimbocca was a lovely rendition. With the meat being so thin, there is the danger of it being dry, but the veal was juicy and well seasoned. The prosciutto added a little saltiness and more meaty flavour and the white wine sauce had a robust flavour of sage; a wonderful herb loved by Roman cuisine but, in my opinion, underused elsewhere. 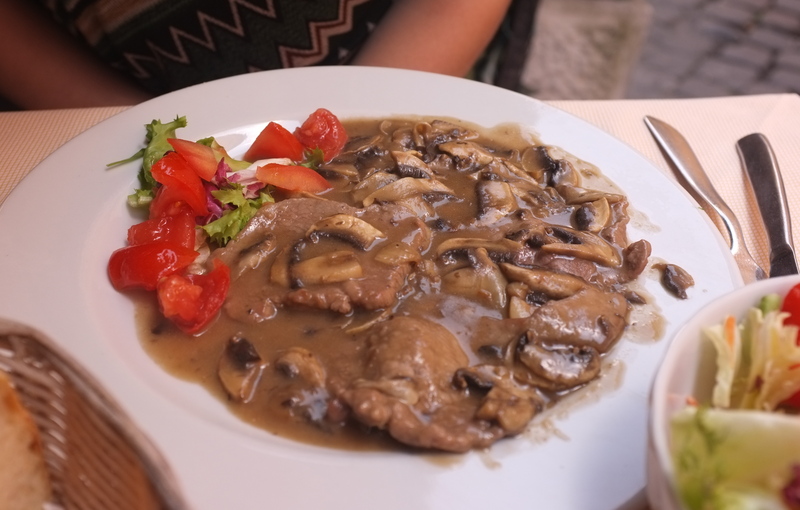 The scaloppine, again a veal dish, had a generous amount of sauce and sliced mushrooms. The full-bodied sauce had a nice tanginess from the Marsala wine and again, the meat was cooked well. Both dishes came with a small side salad, which is plenty following a first course, but if you are having this dish alone, you can choose from the selection of contorni (sides) to complete the dish, from patate al forno (€3.50) to sautéed vegetables (€4.00). Pizza is also available here, as well as a host of house-made desserts which you can browse inside. There three house desserts are all delicious: tiramisù, panna cotta and chocolate mousse (all €4.00).